Legal case management software programs are designed to assist lawyers or law firms manage their cases including client records, schedules and appointments, deadlines, billing and bookkeeping, computer files, and documents. It also facilitates compliance to policies and requirements laid down by judicial and legal authorities. The business side of the legal profession is not normally taught in law school; hence the primary purpose of legal case and law practice management software is to help law firms and legal practitioners run their affairs smoothly. As such, the software carry features for case management (databases, checking conflicts of interest, and statutes of limitations), time tracking (for billing), document assembly, contact and docket management, calendar and scheduling, and client communication, among others. Likewise, law practice management software harnesses technologies useful for modern law firms including word processing, desktop notes, disk encryption, password security, email management, and CRM systems. Overall, the software helps increase efficiency and improves the marketing of law firms to attract more clients. It is one of the factors that make a law firm innovative, as you can see on the table provided. Studies have shown that lawyers and law firms are increasingly using web-based and technology solutions for their practices. According to a 2018 report of the Law Technology Today and ABA Techreport, solo and small firm lawyers reported a 30% to 35% usage of practice management software while larger firms have reported a 62% usage rate. Meanwhile, the latest Annual Law Department Operations Survey by the Blickstein Group found that over 40% of their respondents are embracing the use of AI for their operations. In this article, we’ll delve into the 20 best legal case management software programs for small and medium law firms as compiled by our experts from our database. You’ll learn each software product’s key features, main benefits, deployment platform, pricing structure and more. These will help you determine which solution is the most suitable for your law business. 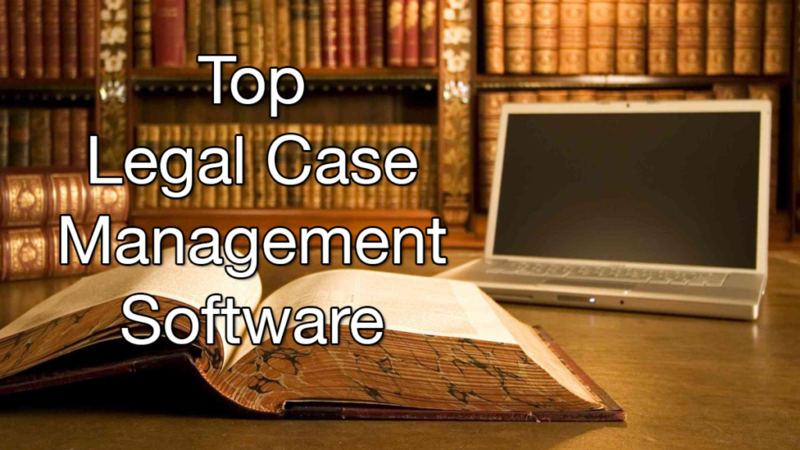 What are the 20 best legal case management software programs? Practicing law is different from managing your law firm. The latter will require productivity and business solutions to streamline daily tasks and workflows, improve productivity and efficiency, and boost revenue generation. Our selection below of 20 best legal case management software products for small and medium law firms have common features to take care of the business aspects of the law office. You can go over each and the links to full reviews to see which one best suits your requirements. PracticePanther is at the forefront of our list of legal case management software, for good reasons. It brings together many capabilities into one intuitive and easy to use online platform. With the software, you get features for time tracking, scheduling, billing, payment processing, and expense management. In addition, the software has robust CRM and case management components to facilitate managing contacts and tracking everything in the office. What distinguishes PracticePanther from the rest of the pack are its smart functionalities including the ability to generate multiple bills in one click; accept credit cards from the invoice; bill hourly, flat rate, or contingency; track trust account balances; and integrate with leading business apps. Furthermore, you can work online with the cloud hosted platform and mobile apps, track time and expenses on any device, send secure messages with a client portal, among others. The system uses enterprise-grade security with 256-bit military-grade encryption, and has customizable security settings, automatic real time backups, and HIPAA compliant file management. Aside from protecting your data, allowing you to work anywhere, and saving you precious hours, you get world class support with dedicated account managers, contact channels through phone and email, and a resource center filled with videos and tutorials. PantherPack got a 97% satisfaction rating from thousands of law firms in 35 countries which use the system. Whatever is the size of your law firm, you get one price of $49/user per month with zero setup or training cost and free future upgrades. Clio is designed for better legal management and offers all functionalities you need to effectively run a law practice. Clio bring with it robust tools to manage cases, clients, data, documents, bills, calendars, time tracking, reporting, and accounting. Billed as the complete management tool for law offices, the system is intended to assist legal service providers through its many features that can organize case details, create workflows, set schedules, share documents, track billable minutes, generate invoices, process payments, and do legal accounting, among others. The online platform helps you simplify matter management through a user-friendly system that ensures important is intuitively presented and easily accessed. The system enables you to undertake efficient information management, documentation, client and case management, appointments and scheduling, office financials and accounting, time-tracking, and reporting. Clio connects with over 70 business apps, giving you a robust integrated platform that works with popular accounting, email, online storage, payment gateways, databases, and other software and services. Clio boasts of being the only legal software that seamlessly integrates with Fastcase which puts an extensive national law library at your fingertips. Fastcase includes cases and primary law for all 50 U.S. states and comprehensive federal coverage. Clio revolutionizes law research by allowing you to search, sort, and visualize cases and data instantly on Fastcase. You can even time your research session in Fastcase and have the activity recorded in Clio. The software offers three subscription plans depending on the features and level of functionalities your law office requires. Bill4Time is a cloud-hosted time tracking and invoicing platform built for the needs of professional services providers such as law practitioners, accountants, contractors, freelances, and small businesses. The software helps you track time from anywhere, streamline your billing, and recover lost revenues. Inefficient time tracking accounts for 30% of lost billables and Bill4Time helps you recover that through precise tracking of time anywhere and anytime from whatever internet connected device. You get one-click timers, one screen batch time entry as well as sync appointment and time entries. With the solution, you can also quickly generate detailed invoices (complete with terms, fees, and discounts) that clients can easily understand. You can create unlimited billing rates and batch invoicing, and customize invoices that your clients can receive and review. Your clients can pay online via a secure payment portal accessible 24/7. Your clients get to enjoy the speed, ease and security of paying online, whether full or partial payments, via credit card or PayPal and through any desktop or mobile device. You can view your financial status and accounting data simply by logging into your dashboard. Bill4Time supports billing on an hourly basis, contingency or flat rate bases, and complies with the standards of the Legal Electronic Data Exchange (LEDES), making it a widely used system among legal professionals. The software works with various payment channels and gateways, including Quickbooks, PayPal and other credit card processors. The system also carries online storage capability, enabling you to store documents on the cloud and sync them to specific cases. Bill4Time is available in three pricing packages – solo, pro, and enterprise – to meet the needs of different users. MyCase is a web-based legal practice management software meant to help small and medium-sized law firms manage cases, track time, automate billing, and communicate with clients. It offers an all-in-one platform to handle contacts, scheduling, document management, case management, online billing and invoicing, time tracking, and calendar management. The online solution doesn’t require technical knowledge, has intuitive features, and can easily be incorporated with modern legal office environments and practices. The platform enables you to organize critical contact and case information; send secure, encrypted messages to directly to clients; accept online payments including eCheck payments; easily create professional invoices; find crucial documents while on-the-go from any device; quickly and accurately bill hours; generate reports with one click; analyze data; and sync schedules with your clients via shareable calendars. Both you and your clients get to use a single secure online portal that has all the features for information sharing. It makes possible two-way communication between attorney and client as well as record and track the communication. You can literally leave your briefcase at the office since MyCase allows you to work anytime from any location on any device, giving you the freedom to take your practice everywhere you go. The software provides android and IOS apps to let you access vital documents, send and receive files, send and get alerts and notification for important events, and keep all concerned updated about developments on a case. There are no pricing packages to choose here because MyCase offers one pricing plan that carry all features and functionalities. Firm Central is a legal case management system developed by Thomson Reuters to help small law firms and solo practitioners streamline office management, track time and billing, and stay updated with Continuing Legal Education requirements. The cloud-based solution brings together all the legal procedures into a single, integrated platform to facilitate matter management, document management, calendar and scheduling, billing and invoicing, document customization, and email monitoring and management. It is designed to simplify, organize, and enhance daily procedures and processes in the modern firm. The benefits you can gain by using Firm Central include 24/7 access to your entire law firm’s data; precise expense and time tracking; quick creation of accurate invoices; reduced risk of legal calendaring errors; and easy management of court deadlines. One of the highlights of Firm Central is its integration with Westlaw Form Builder which allows you to create, customize, and store a variety of legal forms and documents. You can personalize all paperwork according to the specific requirements of a case or client to lessen redundancies and errors in document preparation, save time and resources, and let your focus on the case. Firm Central utilizes top-of-the-line cloud security standards to keep all you legal information safe and accessible while keeping data encrypted in transit and in storage. In addition, Firm Central integrates with other industry-leading Thomson Reuters solutions to boost efficiency and collaboration, enabling you to transition from one task to another quickly and easily – from calculating legal deadlines, generating firm invoices, doing legal research, and more. ActionStep is an online platform that provides everything you need to run your firm including case management, integrated billing and accounting, and more. Its unique workflow technology and integrated approach helps you effectively run your business on both front and back ends. The highly flexible solution can address the simple requirements of small to medium sized firms as well as large law groups. Going beyond case and matter management, ActionStep offers tools for time recording, billing, full general ledger, and trust accounting. It even has features to manage marketing, sales, employees, passwords, facilities, and insurance policies. Its extensive feature set automates processes and workflows for document management, time recording, billing, accounting, payroll, email, and calendar management, among others. Taking care of the business and administrative side of things lets you spend more time working on cases and providing high quality service to your clients. Furthermore, complete digital file generation as well as search and retrieval of information such as documents, emails, file notes, billing, and others can be done in just a few clicks. With the use of live data provided by the system, you can quickly create letters, contracts and other quality documents. You can streamline and personalize your own workflows to fit your needs and practice areas to boost work efficiency, extend quality service to clients, and increase your firm’s profitability. Moreover, you’ll have tools like email management for easy email saving and documentation; calendar management for effective appointment and scheduling; and client billing to ensure accurate client billing and timely payment. ActionStep offers a single SMB/enterprise package for all users. Rocket Matter is a highly-regarded cloud-based legal practice management software that was first introduced in 2007, which makes it one of the pioneering software in this category. It is intended for law firms looking to enhance their revenues, go paperless, or increase confidence in their trust accounting. The solution gives you total control over your law firm business with features that can help you optimize your billing process, get paid quickly, manage caseworks, stay on schedule, know your numbers, work from anywhere, and connect with your firm. On top of these, Rocket Matter promotes paperless operation to help you save time, money and resources. Designed specifically for sole, small and mid-sized practices, Rocket Matter provides speed and accuracy in the creation of invoices and the management of documents. You can store all essential documents in a single location through a document management module that comes with drag-and-drop functionality. You can opt to use other cloud storage services such as Dropbox and Box since Rocket Matter integrates well with third-party apps and services. Worth mentioning is Rocket Matter’s integration with LawToolBox so you’ll never miss a court deadline. It allows you to import calendar dates for matters in jurisdictions all over the U.S., letting you know when published deadlines change so you can stay on top of your cases. Securely collaborate with your law firm is made possible with the Communicator – an instant messaging feature right inside the platform, enabling you to stay up-to-date with everything going on in your firm. With the feature, you can share files, make video conferences, and link your conversations with cases so you can see your correspondence on your matter dashboards. The Communicator works on iPhone, iPad, Android, Mac, and PC. Rocket Matter is offered at a single flat rate of $55/user per month. CosmoLex is a web-based legal case management solution meant to help small law offices and solo practitioners stay on top of the business side of things. The software comes equipped with tools and features to manage billing, timekeeping, business accounting, trust accounting, calendars and tasks, documents, and emails. Its Secure Client Portal makes it easy for you to organize and store all client information and case documents online. You also get an extensive set of practice management tools to handle documents, emails, contacts, case workflows, and case workflows. CosmoLex boasts of having its own built-in legal accounting which, combined with legal time and billing and law practice management, is a fully compliant law office accounting system. With this feature, every work hour and expense you make is captured, all billing processes are automated, and accounting workflows are streamlined. This results in timely bills and payments of your services, improves your improves cash flow, and translates to higher profits for your business. You won’t need third-party apps to do separate billing and accounting work for you. But if you want to, you can have your external accountant or bookkeeper log in to your system once you give them permission. The CosmoLex dashboard loads fast and the interface is user friendly, allowing anyone it easily navigate the system. It is designed for ease, speed, and accuracy. You don’t have to do any setup, maintenance and updates, since the system is completely on cloud for a worry-free operation. CosmoLex goes for an all-in-one price of $49/user per month. Alt Legal is a legal case management software that is intended specifically to cover the practice of intellectual property law. The solution allows you to easily prepare and manage intellectual property by automatically updating case statuses, collecting key client details, reminding you of deadlines, and generating IP filings. The system helps you get rid of repetitive tasks and guides you on the risky and tedious parts of IP law practice so you can put more time and effort on your IP cases and the growth of your law business. Alt Legal comes with a smart docketing feature that enables you to file on time for your clients their trademark, patent, and copyright applications. The software can manage global IP deadlines as well as streamline client intake. Your clients can easily see relevant information with one-click links to the IP offices and application documents. The docketing system can also automatically identify any filings you’ve done, update records, and calculate all filing deadlines without any manual intervention. It significantly reduces time spent on the most routine USPTO filings, including TEAS and TEAS-Plus filings. Likewise, it eliminates back and forth communication between you and your clients since you can just send them a link to the customized intake software where they can submit their details and files. You and your client can get regular updates on application status or changes through email reminders, generate reports, and add key dates to calendars and schedules. Alt Legal provides free data migration to new users and unlimited support to its system subscribers. Pricing is quite based ad depends on specific client requirements. LexRex is an intelligent and secure online legal case management software built to help modern law firms get the most out of their business using current technology. It supports all key processes to enable legal professionals to efficiently manage their clients and cases from quickly recording client details, to comprehensive case management and billing, to accepting online payments. The platform simplifies managing clients and cases by allowing you to deploy and operate LexRex through IT devices of your choice – smartphone, tablet, or laptop. You get the flexibility to customize client and case files, sync documents and calendars, and access the system from anywhere at anytime. You can manage all aspects of the business side of law practice including organizing files and documents, scheduling tasks and appointments, generating professional invoices, and accepting payments online. The software also lets you monitor case activity progress through a timeline; record the time spent on case work; store client communications such as emails, letters, invoices, and phone calls; and customize case files according to parameters you set such as practice area, structure, working environment, etc. From a single dashboard, you get an overall view of the cases you’re handling as well as important details like meetings, documents, emails, calls, tasks, and expenses, among others. You can capture and view the time spent on work-related activities, and activities that are ongoing or have been accomplished. Furthermore, your law firm different billing schemes and generate detailed invoices that carry branding elements. The lowest LexRex plan is priced at $35/user per month. MerusCase is a cloud-based legal practice management system that intuitively adapts to fit your practice, streamlining document automation, time tracking, billing, scheduling, email, case management and more. All its tools and features are integrated into one easy-to-use platform that you can access anywhere at anytime from any device. MerusCase automates your day-to-day tasks through advanced technology that can be used by law firms of different sizes and sectors. The system is ideal for law firms who want to cut costs, save time and focus more on serving clients instead of being bogged down by routine tasks. MerusCase bring with it features and capabilities for efficient document automation and management, time and billing tracking, team collaboration, training and secure data storage. You’ll benefit from the system’s ability to quickly find information by tagging associated contacts, assignments, cases and other documents by type. Its prediction algorithms provide you relevant results based on different filters as well as Global Search that searches content of each document fit your criteria. You can also easily auto-population entire documents, merge case info, and smoothly export information in PDF or Word document. MerusCase offers an advanced accounting system that eliminates the need for an external accounting system, letting you invoice billable time, track payments, and handle balance-forwards, among others. The solution provides you 35 built-in reports for insightful and actionable data about your clients, cases, and law firm’s performance. Data security and storage is taken cared of via end-to-end SSL-encryption and unlimited cloud storage. All these functionalities are available for one inclusive price of $39/user per month. Workshare is a document management platform created for legal practitioners, allowing them to manage and monitor data loss risks while complying with professional regulations and guidelines. Today’s technology allows lawyers to send files and documents quickly through online channels like emails but exposes especially sensitive documents to possibilities of being sent to the wrong recipient or being hacked in transit. Workshare sees to it that all documents shared through email and other applications are devoid of sensitive metadata. It provides secure and structured workspaces for your legal deals and is ideal for working on large volumes of vital documents as it provides the quickest way to compare them. The software allows you to collaborate and share documents with other people. You can access the platform anytime, anywhere as it can be run on desktops, laptops and other devices. Document contents are kept secure with metadata completely stripped off them. The solution is powered by the world’s leading comparison technology – DeltaView – which lets you compare two documents in seconds, wherever you’re working and whichever platform you’re on since Workshare integrates with Outlook, DMS or Office 365 as well as major document and case management systems. Files that have been modified present no problem. The automatic change notifications in Outlook lets you do 1 click finds when files come back with changes. It loads the original and runs your comparison quickly. You can categorize your views by materiality or group changes by type to focus on what matters most. When you need to compare two documents, you can see precisely what has been changed and get to the final version much faster. Workshare can be deployed on desktops and servers or as SaaS with the lowest subscription price pegged at $15/user per month. LegalTrek is a legal case management software for mid-size law firm or legal department aiming to make their business grow and become profitable. It utilizes an all-in-one approach in organizing, billing, and managing clients, documents, and other critical business processes. You’ll be able to have complete oversight of what matters most, increase profitability with timely and accurate billing, manage legal projects and cases, and create professional invoices in minutes, among others. A single system for all your data that is visible, structured, updated, and easily accessible. With LegalTrek, you can quickly search for the information you needs since document and client data are securely stored in one centralized location. You law firm’s workflows are kept streamlined, organized and automated. You can monitor tasks and the people assigned to them, schedules appointments, and calendar deadlines and milestones. Likewise, you can have accurate time tracking and timely billing with sophisticated tools so you can charge your clients precisely with the work hours and service you rendered. LegalTrek is deployable on premise or in the cloud, giving you flexibility for your firm’s deployment needs whether you prefer to have everything on your computer and network or want to keep all your information in cloud-hosted databases. The software integrates with Gmail and Outlook, and is available as a starter package or a customer enterprise plan. HoudiniEsq was developed for small firms to assist them in business-related functions such as organizing documents, setting schedules and appointments, marking calendars for hearings and more. The software can run on the cloud or on premise, and offers an extensive set of features and capabilities such as time and expense tracking, billing and invoicing, case management, and client management, and others. The solution handles everything in the business side of legal practice, enabling you and your law team to concentrate on providing the best legal service to your clients. HoudiniEsq centralizes communication and information processes for a more simplified and intuitive business management of your law office including managing clients, cases, leads, contracts, dockets, client contact, and client communication through emails and certified mails. You get to view and monitor all you law firm’s cases and the attorneys assigned to them. You’ll be able to precisely track time and expenses as well as produce timely and accurate billing for your clients. Practicing law and managing a law firm are entirely different and HoudiniEsq will ably help you in the latter. The software comes with a very useful feature – the ability to determine and eliminate conflicts of interest as it lets you view how an individual is associated with any case. This functionality removes hindrances and provides both your firm and client peace of mind knowing that every case is handled with objectivity. The platform integrates with a number of business tools and services such as Adobe Acrobat, Microsoft Word, Excel, QuickBooks, calendar apps, postal services, Google, and more. Creating and sending custom documents and templates is not a problem. HoudiniEsq is available in two on-premise packages and one SaaS/cloud plan that goes for $64/user per month. Sheriasoft LPN is designed to help law firms, legal departments, and independent law practitioners shift to the modern way of law practice management. It brings together functionalities for billing, time tracking, calendaring, matter, and task and document management under one intuitive, user-friendly, and affordable platform. Sheriasoft LPN supports paperless operation where every process is simplified, automated, and made accurate. It lets you get rid of manual errors in vital aspects of law practice, enhance collaboration, address client expectations, and steadily grow your legal practice. Sheriasoft enable you to create to-do lists, manage your tasks, and track case progress. It doesn’t matter if you’re working on your own or running a legal team, you can easily assign specific tasks or collaborate on a single assignment. You and your team can be notified of any overdue or pending tasks to keep things flowing smoothly. The solution’s client management feature lets you create new contacts; edit contact information; categorize and group them; and attach invoices, matters, and quotations on a specific contact. Meanwhile, Sheriasoft’s time tracking capability allows you to track hours and minutes spent on any matter, task, or activity; organize and classify time usage; and generate accurate bills and invoices. The platform is completely web-based and is accessible from your PC, Mac, iOS, or Android devices. It utilizes bank grade encryption, security audits, and a centralized and secured cloud location for your data. Sheriasoft is available in two plans – for solo practitioners and laws firms, and for legal departments. CaseFox is a free billing software designed for attorneys, CPAs and other professionals to help them in their practice management. It is a multi-user, role-based solution that allows you to manage billing, invoicing, trust funds, case documents, expenses, payments, clients, and more. CaseFox simplifies time and expense tracking for both billable and non-billable time; handles multiple trust and operating accounts; creates task and calendar items for cases; and offers a docketing module to track case related events. Dubbed as the expert solution for billing management, CaseFox streamlines billing tasks by automatically using time entry records for creating invoices. You can export entered time data and case notes to Excel and PDF format, configure different hourly rates for different cases, utilize an income expense ledger as well as use a desktop timer for easy timekeeping. Its client and case management feature lets you keep all information in one place, export and import client information list, and control selected user access to cases. You also get dashboard, calendaring and reports so you can view and get updated on unpaid invoices, upcoming tasks, un-billed hours for each client/case, year to date summaries, upcoming/overdue docketed items and lots more, all in one place. The cloud-based platform comes with native Android and iOS mobile apps and integrates with Xero and Quickbooks accounting, Google apps, and online storage Dropbox and Box. While the basic version is free, there are three paid plans available at affordable monthly subscription rates. Lawcus is a simple visual legal case management software that brings together collaboration, conversation and automation functions in one platform to help you deliver quality service to your clients. Its features include time and expense tracking, workflow automation, document assembly and management, contact management, email integration, secure client portal, workspaces and teams, bank grade security, and support for major international languages. With Lawcus, legal practitioners can visualize their matters with Kanban boards using drag and drop functionality to add tasks, documents, appointments and others. They get to view tasks and activities as they progress, and keep digital matter files in the cloud so they can work anytime and anywhere. Native mobile apps are available to facilitate work on the go. All daily processes and workflows, such as document creation from pre-saved templates, can be automated for more efficiency. You can easily associate your emails with matters just by dragging them to you matters folder. You can also streamline client communication with a secure client portal where you can assign tasks and share documents. Lawcus provides a workspace feature, giving you the ability to create online spaces for each of your teams where they can collaborate with in-house or external counsels on assignments and cases. Lawcus is available in three pricing plans starting with the standard package at $34/user per month which includes a dozen core features and unlimited client/guest users. DPS Software is a UK legal technology company that has been providing software products covering various law areas such as crime, conveyancing, and personal injury. Its practice management software includes tools for case management, digital dictation, legal accounting, and secure client portal. The web-based practice management software is intended to help legal practitioners view their files, create attendance notes, record time, dictate as well as remotely send and receive emails. DPS is billed as a “one” system with one database that houses all the tools you need in one platform, as opposed to integrated components, enabling you to work efficiently, track your work, and drive the growth of your law firm. The software is a combination of different solutions including case management, integrated legal accounting, digital dictation, automated Excel reports, per user screens for live caseloads, matter management, client portal for case tracking, and mobile apps with the newly introduced DPS iTime and DPS SafeChat apps for secure one-to-one communications. The software is capable of generating full graphical practice management reports like fee earner targets and fees receivable and rendered; practice average costs per case; business source profiling and analysis; real-time practice management business intelligence; and KPIs on individual and team members for performance monitoring. Likewise, its high level tracking allows partners and practice managers to easily manage individual productivity time with full risk management at every step. SmartAdvocate is a legal case management application that harnesses state-of-the-art technology to reduce workflow, boost efficiency, and give lawyers better control over their practice. The software was designed and programmed by practicing attorneys and paralegals looking to find ways for law firms to improve their productivity through technology solutions, and thus result in increased profitability. Smart advocate is now used by lawyers for litigation cases involving personal injury, mass tort, and medical malpractice throughout the U.S.
SmartAdvocate features include reports and dashboards to track statutes, filings, deadlines, statuses and much more; calendar to track and display all in and out of court appointments; email that can log all messages relating to your case and undertake mass mailing; document management to create, organize and store all your case documents; workflow and task automation with task templates which can be tailored to fit your work process; advanced search and navigation to easily find files from your case inventory; contacts management; timeline; time tracking; customization; and many more. The software which can be deployed on Windows computers or availed as an SaaS comes with native mobile apps for iOS and Android. It is capable of integrating with SendSuite and Quickbooks, and has a Web cases importer to automatically import new case inquiries and related data through your website. It lowest price starts at $89/user per month. LawGro features a comprehensive set of legal practice management tools to build better client relationships, maintain total control of your processes, easily and swiftly bill clients, and simplify your work operations. The platform also features automation capabilities to prevent you and your team from wasting time on menial, time-consuming processes, thus, allowing you to bill more hours and focus on delivering high-quality services. LawGro comes equipped with a Customer Happiness Index that allows you to measure overall client satisfaction and ensure your clients are kept happy and satisfied. Smart insights can be derived through this tool to further improve client relationships. Additionally, the platform features real-time analytics to help you gain a better understanding on how to improve and grow your services. Being a cloud-based platform, LawGro makes it easy for law firms to view and manage all their clients on the go. Various access levels can also be set to ensure client confidentiality and security.